All transactions are safe and secure with a reliable history in online purchasing behind each of our associates. Buy the House Trust Me shirt to own House clothing and merchandise. Dr. Lisa Cuddy (Lisa Edelstein), the hospital administrator at Princeton-Plainsboro Teaching Hospital, often has to sign-off on risky medical procedures prescribed by Dr. Gregory House. As a result of House's distasteful bedside manner, Dr. Cuddy forces him to spend time treating patients in the hospital's walk-in clinic. She hopes that this will improve his interactions with his subjects. 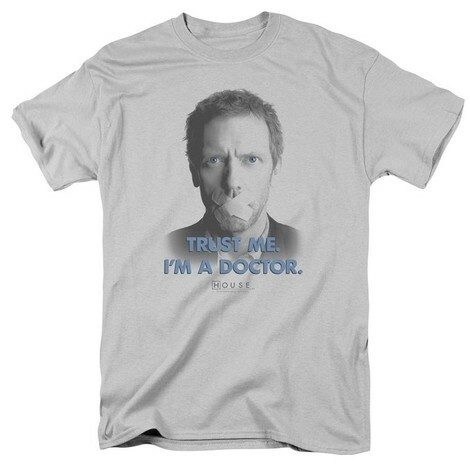 These Hugh Laurie House TV shirts display the eccentric doctor on the front, along with the text, "Trust me. I'm a doctor." This official tee also displays the House TV series logo. In addition to the House Trust Me tee above, browse the House Clothing Gallery for more apparel like men's and women's clothes, kids shirts or hoodies.